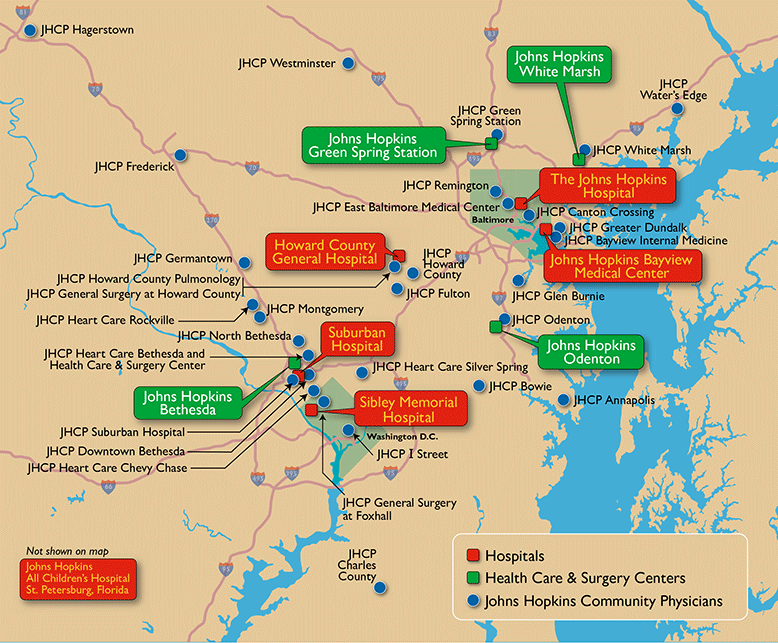 The Johns Hopkins Health System offers patient care at The Johns Hopkins Hospital, (including Brady Urological Institute, Johns Hopkins Children’s Center, Kimmel Comprehensive Cancer Center and Wilmer Eye Institute), Johns Hopkins Bayview Medical Center, Howard County General Hospital, Sibley Memorial Hospital, Suburban Hospital, across Maryland communities through Johns Hopkins Community Physicians and our Health Care and Surgery Centers in White Marsh, Odenton, Lutherville, Bethesda, and Columbia, and pediatric care at Johns Hopkins All Children's Hospital in St. Petersburg, Florida. Information about most of our patient locations is summarized below. You can also visit our online physician directory to find a doctor by name, specialty or location. Johns Hopkins Community Physicians offers primary care, including internal medicine, obstetrics and gynecology, and pediatrics, and some specialty care at 39 convenient locations throughout Maryland and the Greater Washington D.C. region. For more information, or to make an appointment, please visit the Johns Hopkins Community Physicians Web site.